When I wake up to see a handful of my bananas going bad I get so excited, because it's time to bake some banana bread! After going vegan I was determined to find an amazing vegan banana bread recipe, and I think I have found it at last. 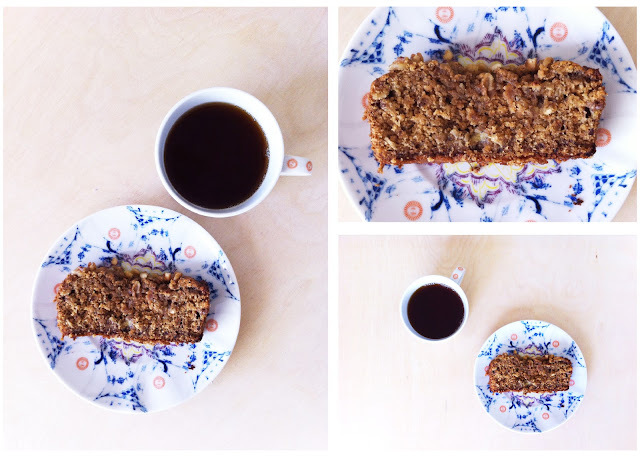 After some tweaking of the recipe I found here, I am happy to say I have now found myself in vegan banana bread heaven with my recipe below. In a large mixing bowl, mash the three bananas, and mix in softened vegan butter (or oil), brown sugar, almond milk, and vanilla. Then add the baking soda, salt, and cinnamon. Lastly, add the flour and rolled oats. Scoop the batter into a greased non-stick bread pan, sprinkle with chopped walnuts on top, and bake for 40-50 minutes (until toothpick inserted in center comes out clean). Serve warm, or let cool and wrap in plastic wrap to keep moist. Happy baking this weekend!